A unique and detailed survey funded by the Rockefeller Foundation confirms the important role that social and community bonds play vis-à-vis disaster resilience. The new study, which focuses on resilience and social capital in the wake of Hurricane Sandy, reveals how disaster-affected communities self-organized, “with reports of many people sharing access to power, food and water, and providing shelter.” This mutual aid was primarily coordinated face-to-face. This may not always be possible, however. So the “Share Economy” can also play an important role in coordinating self-help during disasters. In a share economy, “asset owners use digital clearinghouses to capitalize the unused capacity of things they already have, and consumers rent from their peers rather than rent or buy from a company” (1). During disasters, these asset owners can use the same digital clearinghouses to offer what they have at no cost. For example, over 1,400 kindhearted New Yorkers offered free housing to people heavily affected by the hurricane. They did this using AirBnB, as shown in the short video above. Meanwhile, on the West Coast, the City of San Francisco has just lunched a partnership with BayShare, a sharing economy advocacy group in the Bay Area. The partnership’s goal is to “harness the power of sharing to ensure the best response to future disasters in San Francisco” (2). AirBnB: A global travel rental platform with accommodations in 192 countries. This service has already been used for disaster response as described above. Fon: Enables people to share some of their home Wi-Fi in exchange for getting free Wi-Fi from 8 million people in Fon’s network. Access to information is always key during & after disasters. 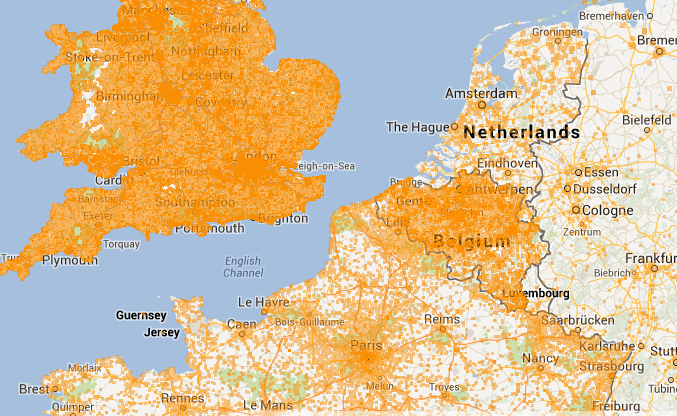 The map above displays a subset of all Fon users in that part of Europe. LendingClub: A cheaper service than credit cards for borrowers. Also provides better interest rates than savings accounts for investors. Access to liquidity is often necessary after a disaster. LiquidSpace: Provides high quality temporary workspaces and office rentals. These can be rented by the hour and by the day. Dedicated spaces are key for coordinating disaster response. Lyft: An is on-demand ride-sharing smartphone app for cheaper, safer rides. This service could be used to transport people and supplies following a disaster. Similar to Sidecar. RelayRides: A car sharing marketplace where participants can rent out their own cars. Like Lyft, RelayRides could be used to transport goods and people. Similar to Getaround. Also, ParkingPanda is the parking equivalent. TaskRabbit: Get your deliveries and errands completed easily & quickly by trusted individuals in your neighborhood. This service could be used to run quick errands following disasters. Similar to Zaarly, a marketplace that helps you discover and hire local services. Yerdle: An “eBay” for sharing items with your friends. This could be used to provide basic supplies to disaster-affected neighborhoods. Similar to SnapGood, which also allows for temporary sharing. Feel free to add more examples via the comments section below if you know of other sharing economy platforms that could be helpful during disasters. While these share tools don’t necessary reinforce bonding social capital since face-to-face interactions are not required, they do stand to increase levels of bridging social capital. The former refers to social capital within existing social networks while the latter refers to “cooperative connections with people from different walks of life,” and is often considered “more valuable than ‘bonding social capital'” (3). Bridging social capital is “closely related to thin trust, as opposed to the bonding social capital of thick trust” (4). Platforms that facilitate the sharing economy provide reassurance vis-à-vis the thin trust since they tend to vet participants. This extra reassurance can go a long way during disasters and may thus facilitate mutual-aid at a distance. This entry was posted in Crowdsourcing, Disaster Resilience, Humanitarian Technologies, Social Media and tagged AirBnB, Disaster, Disaster Resilience, Economy, Share. Bookmark the permalink. Thanks for sharing! This is a great list. It’s good to know people will have our back in times of need. Another group that can be added to it is Store it Squirrel. It’s like Airbnb, but for storage. Super, many thanks for reading and sharing, Elizabeth! Some cool stuff here about a couple of the places I have am visiting on visiting on my trip. Interestingly, social media came up today in my meeting with SAFE (Safety Awareness For Everyone) based in San Francisco. They run the local Neighbourhood Watch schemes in the city and they said that there had been a marked increase in people wanting to come together as a community to be more prepared and look after each other. They mentioned that this increase ties in with the local enthusiasm for social media tools like Next Door, where you have a group of people that you can share messages, but they a location based connections rather than people you have met face to face. They said that 30% of posts were actually about public safety and they thought that there would be a big use of the site if there were a major incident in the area. Very neat, thanks for sharing, Lou! Thank you for the great article. Wanted to add Ishinomaki Lab, a furniture workshop founded after the 2011 tsunami in Japan, to help locals rebuild by making their own furniture using designs donated by designers. Worked with them—and learned how design can be survival tool in the face of disaster. Very interesting! Many thanks for haring, Ayse.